Snakes are polarizing. Some people fear them, and others love them enough to keep as pets. A few people say, “The only good snake is a dead one.” I hope I can convince you that they are much better off alive. Besides, it is illegal to kill snakes in Virginia. Most snakes do not need to be feared. Only three in Virginia are venomous, and those are the timber rattlesnake—found in the mountains of western Virginia—water moccasins or cottonmouths found in wet areas of southeastern Virginia, and copperheads, found throughout Virginia. That means most snakes are nonvenomous. Snakes will not chase you, jump out of trees, or otherwise try to harm you. They have more to fear from you than you from them, and will only attack if they feel they have no other option. Black snakes are the most common snakes we see, but you don’t want to kill them. Not only do they eat rodents, but they consume copperheads. 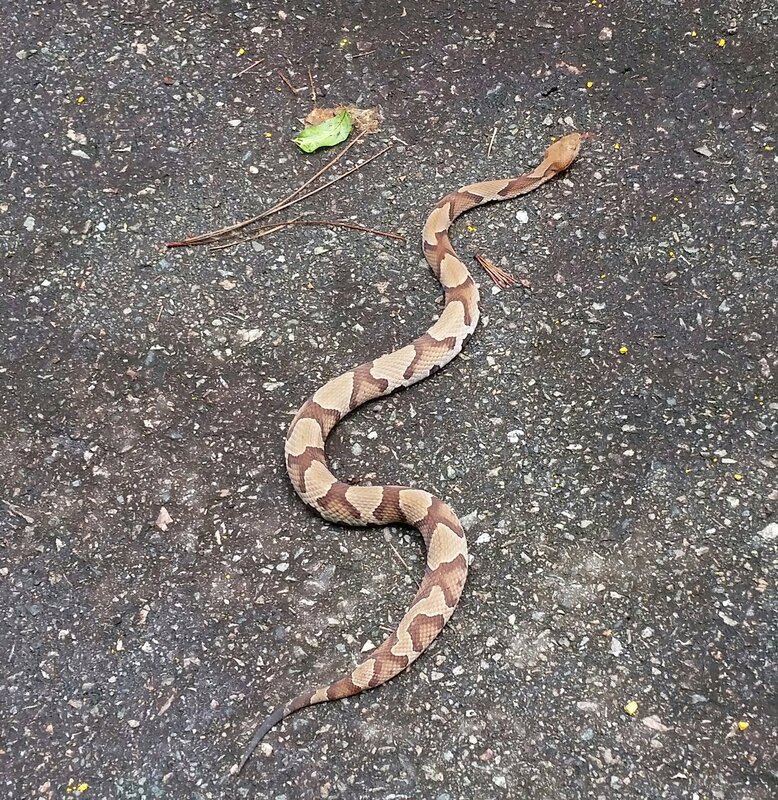 Usually, if black snakes are around your house or outbuildings, copperheads will stay away. Another reason not to kill them. If you see snakes around outbuildings, it may be because they are attracted to the mice and other rodents inside. They are very effective mouse traps. Before deciding to get rid of the snakes, check for signs of rodents and get rid of them, or let the snakes do their jobs. Unfortunately for bird lovers, some snakes like to eat eggs and chicks. However, this is part of the checks and balances of nature. Besides, many of us are consumers of eggs, so we can’t begrudge our serpentine neighbors. Our fore parents had a respect for snakes. Snakes were used on many flags during American colonial times. The most famous are the Gadsden flag, which is the picture of a coiled timber rattlesnake and Don’t Tread on Me on a yellow background. Snakes appeared on battle flags. The message was, “Watch out for us. We may not be mighty—like the large British army—but we can pack a punch.” Benjamin Franklin also used the snake in several of his woodcuts. A popular one from 1754 is pictured here. The head represents New England, and the other pieces represent the colonies going south on the Eastern seaboard. But why is the snake in pieces? Folklore stated that if a snake was cut in two but could put itself back together before sunset, then the snake would become alive again. If it could not get its pieces back together by that deadline, it would remain dead. The colonies at the time didn’t always work together and were more interested in protecting their own interests. Through this woodcut, Franklin warned the colonies to unite quickly before it was too late. Snakes, whether defending your property from vermin or scaring off the British, have an important role in our lives. Next time you see a snake, instead of running for your shovel to kill it, let it be. You will be rewarded. From Virginia Wildlife Management and Control Facebook page: BE AWARE- We here at VWM&C receive a lot of calls about baby copperheads but 95% of the calls are not copperheads at all, so here’s a picture (Top, Left) of an actual baby copperhead and as you can see, it has a very bright yellow or sometimes “greenish” colored tail that slowly disappears as it gets older and that’s the quickest and easiest way to distinguish one. Please share this with family members and friends, it could save you, them or your pet’s life! Thank you and please be careful out there because we’ve already been getting a lot of snake calls into our office the past few weeks. If you encounter any kind of snake, take a picture of it and text it to 804-617- 7086 anytime day or night and we’ll be more than happy to positively identify it for you and visit our website at: www.virginiaanimalcontrol.com, 24 Hour emergency service available. Charlene Talcott and Virginia Wildlife Management and Control photos.